A study of 72 galaxy cluster collisions sets new limits on how dark matter interacts with itself. Dark matter is the mysterious substance that makes up most of the matter in the Universe. X-rays from Chandra and optical data from Hubble were used to help narrow down the possibilities of what dark matter can be. 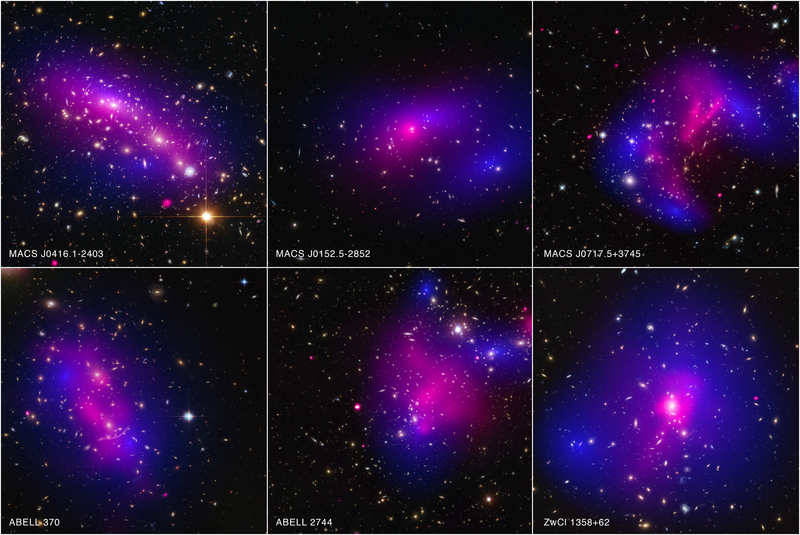 This panel of images represents a study of 72 colliding galaxy clusters conducted by a team of astronomers using NASA's Chandra X-ray Observatory and Hubble Space Telescope. The research sets new limits on how dark matter — the mysterious substance that makes up most of the matter in the Universe — interacts with itself, as reported in the press release. This information could help scientists narrow down the possibilities of what dark matter may be. Galaxy clusters, the largest objects in the Universe held together by their own gravity, are made up of three main components: stars, clouds of hot gas, and dark matter. When galaxy clusters collide, the clouds of gas enveloping the galaxies crash into each other and slow down or stop. The stars are much less affected by the drag from the gas and, because they occupy much less space, they glide past each other like ships passing in the night. The collisions in the study happened at different times, and are seen from different angles - some from the side, and others head-on. The clusters in the panel are from left to right and top to bottom: MACS J0416.1-2403, MACS J0152.5-2852, MACS J0717.5+3745, Abell 370, Abell 2744 and ZwCl 1358+62. This study builds on previous findings involving Chandra and other telescopes, namely the work on the Bullet Cluster and other individual galaxy cluster collisions. Coordinates (J2000) RA 04h16m 09.90s | Dec -24° 03´ 58.00"
Coordinates (J2000) RA 01h 52m 34.45s | Dec -28° 53´ 42.23"
Coordinates (J2000) RA 07h17m 33s.80 | Dec +37° 45´ 20.02"
Coordinates (J2000) RA 02h 39m 50.5s | Dec -01° 35´ 08.00"
Coordinates (J2000) RA 00h 14m 19.51s | Dec -30° 23´ 19.18"
Coordinates (J2000) RA 13h 59m 50.60s | Dec +62° 31´ 04.00"
I propose that the gravitational anomalies we observe and lead to speculation of "dark matter" are caused by the presence of a parallel universe, overlapping with our universe. This parallel universe was formed - like our own- after the "Big Bang" in the interuniversal medium IUM . It is of the "multiverse 2" type and does not lie beyond our horizon- as is commonly assumed. is contained in a sea of dark m e. We should be concentrating on Gravity. To go along with Mr. Stephen, I can see that dark energy created and destroyed is a possibility. Now with that, what determines the creation destruction of the energy? Many things can be said, great article. I think dark matter could be the walls of universe having a extremely strong gravitational field. The gravity could be so much strong that it would even absorb light and since the light is not reflected back it appears dark to us. In my opinion, dark matter is the opposite of "normal" matter and dark energy is the opposite of the "normal" energy we are accustomed to. Therefore, if what we have discovered in the past about the laws and properties of matter and energy is true, then the equivalent that violates those laws and properties is dark matter. Eg if matter can neither be created nor destroyed then dark matter can be created and destroyed etc. Let's try to unlearn or twist this in an attempt to unravel the mystery. No, the blue coloring of dark matter in the images is not photographic or observed, it is applied by the researchers so that we can see the mapping of the dark matter. The dark matter is invisible and only detected by gravitational lensing. The lensing enables researchers to map it, and the mapping is colored blue so we can see it. The article says that they are combining x-ray light with visible light. The blue is visible light not dark matter. That is why it is labeled optical. What is the genesis of Dark Matter? Why call this phenomenon Dark Matter? Given that Dark Matter is still beyond our technology to detect, our observations are based on the gravitational effect on surrounding matter. while theoretically possible that thermal increases would be detectable, our current lack of understanding in the full nature of DM makes a change in thermal properties similarly undetectable, we would have to observe thermal changes in surrounding matter, which are already being affected by the collisions themselves. Following on from what Alex said, is it possible that the moving mass of galaxies warps space time which causes these unexplainable observations of light? Has dark matter and dark energy been viewed as maybe the same substance, having similar properties to water which can be a vapor, liquid or solid? Could it all be dark energy but be transformed into dark matter as gravity compresses it? Also if the universe was started by one big bang and everything spreads out in a circular motion do all the calculations being made take it account the fact that what we can observe is only a very, very small slice of a much bigger pie and wouldn't each supernova in a sense be a small new big bang in its own right? What do these observations tell us about what dark matter could be made of? What about dark matter just being areas where there is no space time. Wouldn't those pockets still look like they bend light? The majority of baryons created at atom formation were hydrogen and helium and most of the hydrogen rapidly became molecular. As we are unable to see radiation from molecular hydrogen and helium at astronomical distances, these may account for dark matter. Matter has to clump together in order to form clouds and stars. Any matter that has not been swept up in this way would be dark but still have effects on acceleration of the universe etc. 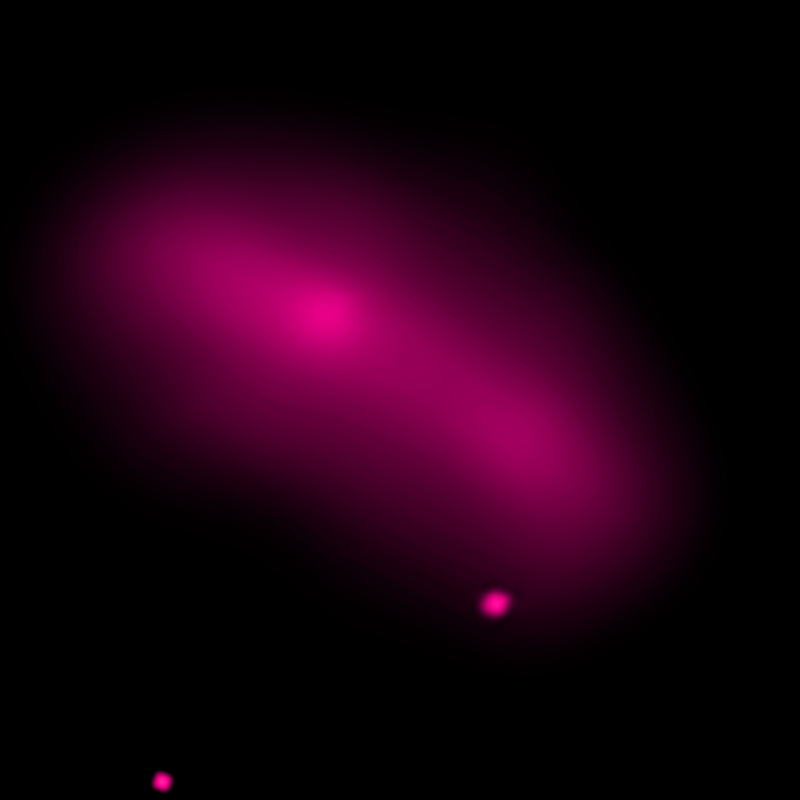 Could it be the case that in most of space matter has not clumped together sufficiently to be seen, so is still dark? The blue areas in the image shown to be dark matter are actually computer simulations of where it thinks dark matter is distributed Modelled by observing gravitational lensing. Maybe I just misinterpreted something, but how can we see dark matter if it's dark? It doesn't make sense. Dark matter is invisible, but we know it's there because of its physical effects. But I'm just a 17 year old, so what do I know. During collision if gases become very hot can't the Dark matter because they are more dense? Dark invisible energy-matter can be seen surrounding star clusters, from your photos, reflecting light from the stars and varying their density with distance from the center. The universe and beyond is made of high-energy particles continually in contact with each other varying in density from invisible billions per cc in space to solids requiring trillions per mm 3 in the core of black holes. Sir, I want to know about dark energy in details. Also I want to research on this subject. As the building blocks of the universe are broken down and defined, so are the assumptions that were used to discover them. I am 17, a Jr in high school alternative. My comment may be irrelevant to the conversation, but I would actually like to learn more of dark matter and dark energy. Can anyone show me to an accurate source that can show me any and all studies on dark matter or dark energy from any early research to any research that has come up in recent years? Sorry, I must be a bit dim today but in what sense is the dark matter blue? I thought the dark matter was dark i.e. black. Can someone explain this? I am feeling like an idiot at the moment. Thank you a lot about this article. All your information very excited. Always will be a pleasure explore knowledge with you. If, as was described in News Articles about this finding, it is the case that Dark Matter has very little interaction with itself as it passes through itself, how is it that the Blue areas showing the Dark Matter have central points in the clouds which are more dense than the outside, as if it was gravitationally effecting itself like normal matter would. If it had little to no effect on itself, surely it would be more uniformly distributed. Has anyone proposed a theory of dark matter being a product of black hole emissions? Perhaps an exotic particle produced constantly when black holes are created and afterwards during their lifetime.